If you like golf then it is natural to find a quality rangefinder that can suit to your budget and can help in making accurate decisions. Bushnell golf rangefinders can be the right choice for you if you are looking for a rangefinder from a reputable American brand. But to find the most suitable one for you may not be very easy unless you have brief information about some of the top golf rangefinders from Bushnell. You can trust on Bushnell as they are in the business of sports optics since long. While making golf rangefinders Bushnell covers all the things required by the golf players to pay the value of the money spent on their products. The comparison of the features of some of the top golf rangefinders manufactured by Bushnell, provided here under, can help you in buying the most suitable one for you. This white coloured rangefinder allows you to reinforce the laser laced on the flag with short vibrating bursts due to the Jolt technology with Pin seeker technology used in it. It can accurately read the ranges from 5 yards to 1000 yards and view a flag within one yard range from over 400 yards. The fast focus system and 5 times magnification ability can allow you to play the shot more clearly. It is a certified and legal device for professional golf tournaments players. Its package includes battery and premium quality carry case along with limited warranty for 2 years. Average power output of this first class laser golf rangefinder is less than 0.5mW. This golf rangefinder includes a set of amazing features in its small size including the factors making it ergonomically sound. It provides unbelievable accuracy as expected from this brand. Bushnell’s patented Tour V4 Slope technology used in it allows you to compensate the distance between the declining and inclining hole. It is a legal device for tournament players if it slope mode is deactivated. This golf laser rangefinder is packed with all the innovations made by the leading brand of golf industry, Bushnell. The company has included its trusted and patented Slope Technology to provide compensated distance on the basis of inclined and declined hole to the golf players. It can also turn off traditional USGA device when required. In order to eliminate the doubt of being locked on the flag the company included PinSeeker with JOLT Technology in this rangefinder. It is entirely wrapped in a completely waterproof housing made of metal to allow the golfers to use it in any weather condition. Main technologies used in this golf rangefinder include DDT or Dual Display Technology which allows the user to switchover between the sharp black display and bright red vivid display depending upon his choice or the lighting conditions. Pinseeker with Jolt Technology used in it allows the players to lock the flag with laser to play short vibrating shots by reading the distances exactly. Slope Compensation technology used in it can help in calculating and adjusting the distance on the basis of the angle of the slope. 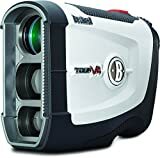 The Exchange technology used in this white coloured golf rangefinder from Bushnell allows you to use it legally for tournaments and Slope when required. It also includes Dual Display Technology to allow you to switch between crispy black display and bright red display depending upon your liking or lighting conditions. The Slope Compensation system provided in it calculates e distances and adjusts them according to the degree of inclination. It also includes PinSeeker with JOLT Technology allows the players to confirm that they have locked on the flag. It also helps in eliminating all the doubts by measuring the distance accurately. It measures the distances in yards more accurately, with accuracy range of +/- 0.5 yards, than other similar devices ranging from 5-1,300 yards with the help of its 6 times magnification range. It can be used legally by tournament players just by installing red faceplate and at USGA functions by installing black faceplate. This golf rangefinder is available in red and white colour variants to choose from as per your liking. It is packed with various patented technologies of this brand including Slope Technology and Pin seeker with jolt Technology to make it one of the most accurate rangefinders. The Slope technology used in it helps in compensating the distances on the basis of the degree of decline and incline of the hole whereas Pin seeker with jolt Technology allows the players to play short vibrating shots to lace the laser on the flag. The range of accuracy of this golf rangefinder varies from 5 yards to 1,000 yards and a flag within one yard can be viewed from more than 400 yards. Its fast system of focusing and 5x magnification ability allows you to view the shot more clearly. It is provided with a premium quality carry case, red protective skin made from silicone, limited period warranty for 2 years and battery. The average power output of this first class rangefinder is less than 0.5mW. This golf rangefinder from Bushnell includes JOLT technology with PinSeeker to allow the golfers to play short vibrating shots to confirm that the laser is locked on the flag and PinSeeker is activated. The look, performance and feel of this rangefinder have set new standards for the manufacturers of full range of these devices. The patented Slope technology of this brand is used in it to help the golfers in compensating the distances to avoid short shots on the basis of the degree of decline and incline of the hole with +/- 1 degree accuracy. It helps in compensating the range on the basis of type of club used and course of the ball. All of its results can be seen on its LCD display. An uphill shot played at 6 degree inclination from 150 yards is actually played from 166 yards which means that you can be short of 16 yards without compensating the slope. Over 300 yards to meters/yards of flag, ergonomic design, rubber grip for stability, accuracy within one yard, 5x magnification and 5 yards to 1,000 yards range are some of the other important features of this golf rangefinder form Bushnell.